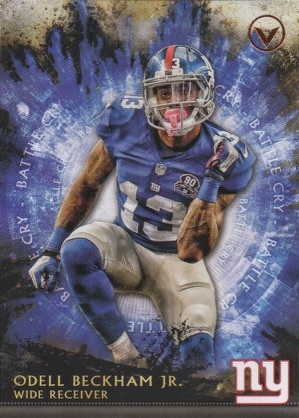 2015 Topps Valor Football presents the game for what it is -- a battle. Returning for a third season, the designs continue to be bold and the themes with a distinct gladiator feel. Far from the most expensive product on the market, hobby boxes still come with four hits including an autographed relic and another autograph. 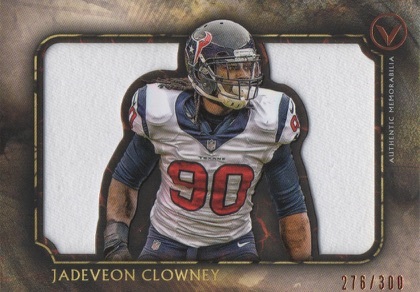 The 2015 Topps Valor Football base set has 200 cards. 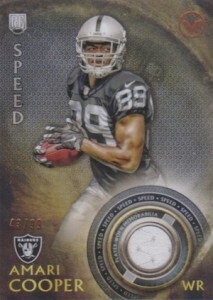 Speed parallels are only in hobby packs. They're joined by numbered Strength, Courage, Discipline, Glory, Valor and one-of-one Heart parallels to land one per pack. 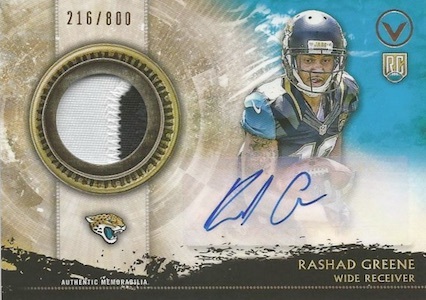 On the autographed relic front, Shield of Honor Patch Autographs are the most common. More than 40 rookies and veterans are included on the checklist. Serial-numbered parallels include Speed, Strength, Courage, Discipline (#/25) and Heart (1/1). New Battle Paint cards come with a rookie autograph and an inscribed eye black sticker. Numbered to 2, these are extremely tough pulls. The Valor Autographs checklist also has more than 40 players. They have five levels of parallels, all of which are serial-numbered. One-of-one Heart versions are hobby exclusives. Also found only in hobby packs, Alliance Autographs pair up multiple players from the same team. Dual- and Triple-Alliance Autographs are numbered to 10 while Quad-Alliance Autographs are limited to 5. 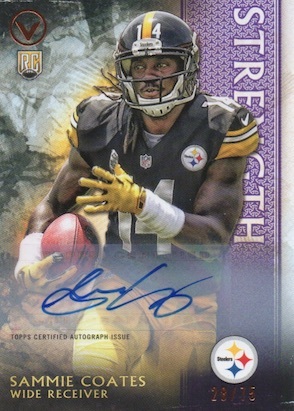 New to 2015 Topps Valor Football are Battle Cry Autographs. Done in silver ink on a black backdrop, these cards come with a rookie signature that's inscribed with their pre-game song of choice. 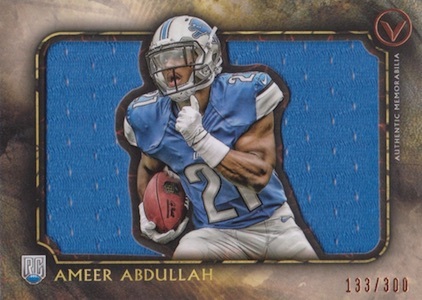 Jumbo Relic Die-Cut cards come with an over-sized jersey swatch from one of more than 30 players. Speed, Strength, Courage, Discipline, Valor and Heart parallels are all numbered. 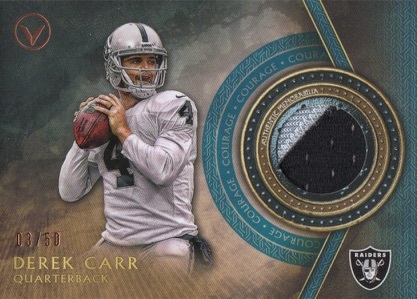 Discipline (#/25) and Heart (1/1) versions come with patches. 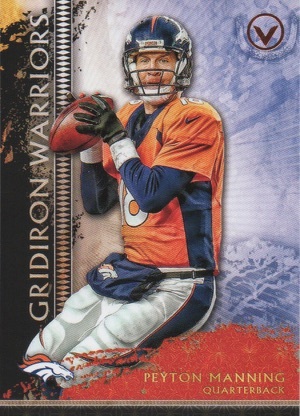 Valor (1/1) parallels have a Nike laundry tag. One-per-box Valor Patch cards have a checklist that's over 40 veterans and rookies. They have five levels of numbered parallels. 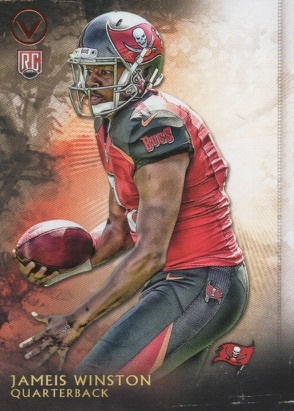 2015 Topps Valor Football has a pair of basic insert sets. Gridiron Warriors (1:4 packs) is the more common of the two, delving a little deeper into what makes 25 retired and current players tough and combat-ready. Autographed versions are numbered to 25. 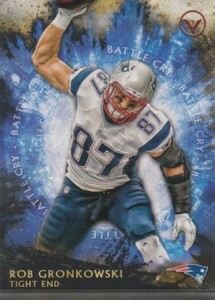 Battle Cry (15 cards, 1:10) cards emphasize emotion with shots taken from on-field celebrations, big plays and speeches. 25 cards. Serial numbered 1/1. 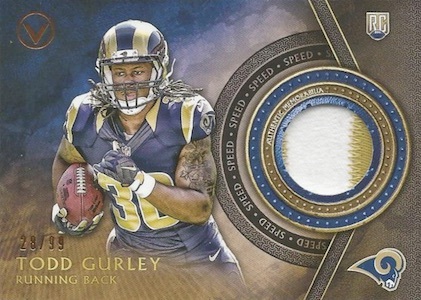 Good: The main design is appealing, thick relic cards, most hits are numbered, inserts are eye-catching. 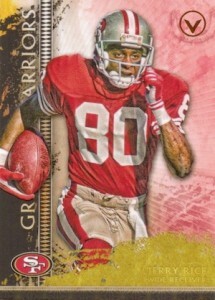 Bad: Bigger print runs among some of the hits, sticker autographs, bland/odd parallels are still an issue. The Bottom Line: Valor is an okay NFL product. While the primary design is solid, Valor struggles to stand out in an already-saturated market. Without a feature that makes it unique, there is less of an incentive for collectors to purchase by the box. In recent years, the main selling point of Valor has been the main design. Base design is important, but in a product that is ultimately about the hits, that is not really something that should be the main takeaway. While Topps definitely toned down the base design from last year, and I personally like the 2015 design much better, the parallels remain mostly unchanged. The end result includes large font headlines like COURAGE, STRENGTH and SPEED along with a color stripe along the right third of the card. It looks awkward and clashes with the base design. One new feature that is nice is the addition of inserts. Last year, it was a little boring to have a product with 20 packs that only contained base cards and hits. Battle Cry and Gridiron Warriors add much-needed variety. I particularly like the design of Battle Cry as they feature a vivid paint-splash effect and utilize more passionate player images. The final component of 2015 Valor is the hits. This is another area where little has changed. The thick relics have a quality feel but the stickers continue to be a letdown on the signed cards. Also worth noting, the Jumbo Relics (one per box) offer a large jersey piece, but upon examining the one I pulled, I honestly cannot tell what the “relic” is from. It is definitely not a jersey and the ambiguous disclaimer on the back offers no help. It is also annoying to pull a Shield of Honor Autographed Patch card that only includes a white jersey swatch and no patch of any sort. Similar to previous years, the base set offers a mix of veterans, retired players and the new class of rookies. While there is some veteran content amongst the hits, the majority of the subjects are rookies and second-year players. Most of the big names are there, however, and since nearly all the hits are numbered, there is no wondering which players are short prints. With prices hovering around $70-90 per box and a guaranteed four hits to be found, there are certainly worse box values out there. However, there are multiple levels of value, and one key part is long-term value. By the end of the year, there will be tons of event-worn relics and sticker autographs and Valor does little to stand out from the pack. It is hard not to think that prices will continue to drop on this one and it might just be better to wait it out. 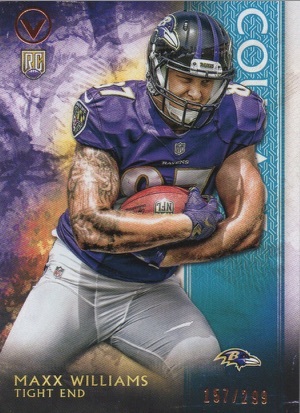 Although it is ultimately a moot point with Topps’ NFL license ending, the small updates to Valor all enhanced the fun for me. Added inserts along with a tweaked base design helped the enjoyment of the product. 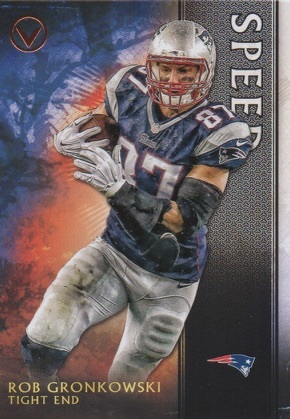 Although minimal, given the progression forward for the product, I would have been interested to see a few more changes in 2016 Topps Valor, maybe even a return to on-card autographs like 2012 (hopefully in silver). However, this looks to be the swan song for a product that never really found its place with collectors. 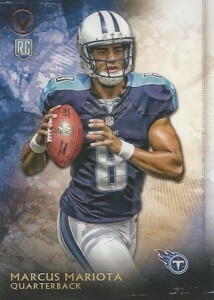 Are they making topps finest football this year? Its my favorite product every year and usually by now you guys have a preview of them by now. Not sure if it’s planned for this year or not. 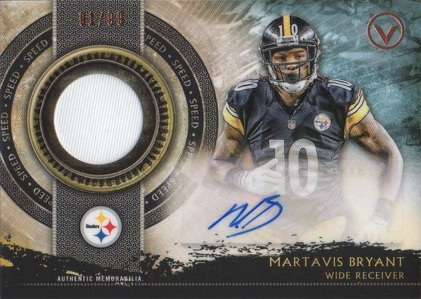 Topps is still unveiling their 2015 football products. Really wanted to like the product this year. Wasn’t able to have fun with it. Maybe my expectations were too high. Once again, the hobby and retail cards use different stock. Really easy to notice looking at the side of the card. Then to top it off, both the autos in my hobby box were of Rashad Greene. For me, that was a huge letdown. Don’t expect to pull stars from a box, but do expect different players. So that pretty much killed it for me. If the price drops significantly, will buy another hobby box. Otherwise will wait. Great product with a unique look. Can anyone confirm Eric P. statement about retail and hobby being a different thickness? I could not see a difference this year. Jon I’ve only just bought some retail this year but I compared it to hobby and retail from last year and 2015 retail is the same thickness as hobby from 2014 and much thicker than 2014 retail. Unless hobby is much thicker than last years hobby Eric’s statement is incorrect. But again I’ve yet to purchase any hobby. I bought two hobby boxes this week and pulled a 1/1 signed jersey of Odell Beckham and signed jersey 12/25 Kelvin Benjamin. For the price you can’t beat pulling four hits per hobby box. Don’t waste your time with the blaster boxes from the retail stores. Hobby boxes all day everyday. Card stock is the same. I have just scaled the Hobby and Retail (Blaster Box – 7 Packs+Jersey) Version of a Paul Hornung Base Card and they are both 2.47 gramm and have same thickness of 0.55mm (0.021 inch). Valor 2014 was my favorite design and Valor 2015 looks really great too, however they could have made the parallels band more subtle … last years version was way better so only 4 Stars this year. “RC” symbol is in color compared to last years gold stamp but goes well with the overall more colorful design. Got 3 of these boxes in the past year, the design is awesome and there were no damaged cards. 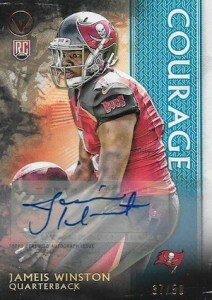 My favorite pull was a 3 color Winston RPA /99! Also got another and pulled a 1/1 battle anthem auto in it! My other auto was very nice too. By far my favorite product!